That remarkable voice is the first thing you notice on almost any of Lefty Frizzell’s records. Smooth, supple, fluid and mellifluous, it marked him out as one of the finest singers ever to appear in the history of country music. There was also a light sweet-toned quality to his voice, which was extremely unusual in the genre. Sometimes, listening to his records, I have thought that, if he had been born into an earlier generation, he could, perhaps, have sung light opera (not a thought which has often come to me when listening to Johnny Cash, for example). What made Frizzell such an important figure in the history of country music, however, was not simply the quality of his voice, but rather the manner in which he sang. He introduced into the country mainstream the arts of bending notes, slurring words and stretching out syllables which, while frequently used in blues, jazz, folk and gospel, had not been really been utilised to the same extent there before. An example of his ‘startling melisma’ (as it has been described) can be heard in the opening of his classic song, Always Late (With Your Kisses), where the first word ‘always’ becomes ‘alw-ay-ays’ in Lefty’s version. [In his classic book, “Sweet Soul Music”, Peter Guralnick defines ‘melisma’ as “the stretching of a single syllable over the course of several notes or measures.”] The use of this technique did not, however, simply help him to show off the brilliance of his vocal technique (although, on occasion, it undoubtedly did) but also allowed him to add extra-feeling to lines in his songs which on paper appeared comparatively banal or prosaic. Over time, Lefty’s innovations in this regard had such a widespread influence that they have become a widely accepted part of modern country music singing. The novelty of his style at the time, however, was displayed by Hank Williams’ complaint to a friend in early 1950 that Frizzell’s singing was “whiney and no good” and that he was unable to “sustain a note” properly. Although Williams later changed his mind on this point, the comments nevertheless indicate the innovative nature of Lefty’s vocal style at this point in his career. Colin Escott has also pointed out that while Hank had developed his “full throated style” through singing in rowdy clubs “without amplification”, from the very beginning Frizzell’s vocal technique was dependent on the use of the microphone. This allowed him to sing in the gentle, relaxed and intimate way which became his trademark. In this respect, there is an occasional similarity between Lefty’s singing and that of some of the early ‘crooners’, particularly Bing Crosby. As with Crosby, Frizzell’s singing never sounded forced or strained. As master craftsmen, both men made the art of singing seem natural and almost effortlessly simple. Like so many other great country/Americana singers, Frizzell was born in Texas, in his case in the comparatively small town of Corsicana. From an early age, he showed a keen interest in country music (Jimmie Rodgers was an early and abiding hero of his) and a precocious aptitude for singing. Indeed, he was already appearing on shows on his local radio station even before he was a teenager. His big breakthrough, however, came in 1950 when the producer, Don Law, signed him to Columbia Records. When combined as a double A-sided single, the commercial success of the two songs launched Frizzell’s career as one of the leading country stars of his day. Indeed, in this first golden (as it were) phase of his career, Frizzell’s records managed to combine sustained commercial success with the maintenance of a very high standard of artistic excellence. This meteoric rise in his popularity was clearly displayed by the fact that in October 1951 he had four songs in Billboard magazine’s Country Top Ten. The Number One he achieved in that month, Always Late (With Your Kisses), had a relatively simple and straightforward melody and lyric. What transformed it into an instant classic, however, was the alchemy of Lefty’s singing style. He combined this with an intuitive flair for ornamentation, which he invariably used in the right place to improve whatever song he was singing. He was also fortunate to be surrounded by a fine group of musicians (who included the great Curley Chalker on steel guitar) whose playing perfectly complemented Frizzell’s singing style. During this period, he also recorded a classic tribute album to his early hero, Jimmie Rodgers. On it, he proves himself to be one of the very finest interpreters of Rodgers’ work that there has ever been. Indeed, only Merle Haggard’s classic Same Train, A Different Time: A Tribute to Jimmie Rodgers album has come close to matching the quality of Frizzell’s work. Its success lay principally in his combination of a deep respect for Rodgers’ music with a willingness to interpret it in his own distinctive way. Such is its quality that I could have opted to include almost any of the tracks from Lefty Frizzell ‎Sings The Songs Of Jimmie Rodgers. In the end, however, I settled for Travellin’ Blues as it is one of his best ever vocal performances. My final selection from this early ‘golden’ period of his career is the beautiful country ballad, Forever (And Always), first released in 1952. Again the song is a relatively simple one melodically, but Lefty’s quiet, almost hushed, vocal and the superb fiddle accompaniment by Johnny Gimble combine to transform it into one of his more magical performances. 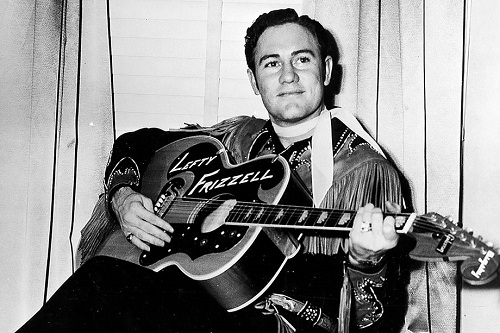 At this point in his career, Lefty Frizzell appeared to be on a roll both in a commercial and an artistic sense. It was from this point onwards, however, that the Midas touch that he had displayed up to then began gradually to fade. In part, this was due to the emergence of a group of young rock and roll stars like Elvis Presley, Jerry Lee Lewis and Carl Perkins, who began to draw away some of his target audience. At the same time, he began a gradual descent into some of the personal problems associated with life on the road. Suffice it to say, perhaps, that a song like this one was not simply a product of observing other people’s problems. He also began to have difficulties in terms of writing new songs to match the quality of his earlier work. As a result, he became progressively more dependent on the songs which other songwriters supplied to him. As these were often of variable quality, his recordings gradually became more hit and miss affairs. It should be noted here, however, that even when the songs he recorded were not worthy of his great talents, Frizzell continued to sing them superbly. Indeed, such was the quality of his vocal technique that Frizzell could transform even a relatively ordinary song into a master class in the art of country music singing. Although his country hits dried up somewhat in the years between 1953 and 1959, from that year on he had a brief spell of renewed commercial success – one which saw him record some of those songs with which he is still most closely associated. This relatively short-lived revival began with his recording of the excellent Marty Robbins’ song Cigarettes And Coffee Blues. Again, Frizzell’s vocal on this track is beautifully fluid and brilliantly demonstrates his masterly phrasing. The way he floats over the melody on the song reminds me at times of the way Elvis sang on some of his great 1960s pop records like She’s Not You and (Marie’s The Name) His Latest Flame. Here’s a fine live performance of Cigarettes And Coffee Blues. My next two selections, The Long Black Veil and Saginaw, Michigan, both owe something to the shift towards a more ‘folk’-based style which occurred in country music in the late 1950s and early 1960s. The chart success of some of the more commercially oriented folk revival acts in this period. undoubtedly had some influence on this trend. Long Black Veil is, perhaps, Frizzell’s best known record, especially outside country music circles. This is largely due to the many cover versions of the song from artists of the stature of Johnny Cash, Joan Baez, the Band and Bob Dylan. As Peter Viney pointed out in response to the recent Toppermost on Johnny Cash, ‘Veil’ was originally written by its co-authors, Marijohn Wilkin and Danny Dill, as a ‘pastiche’ and as a ‘send up’ of the murder ballad genre. Notwithstanding this, Lefty sings the song straight and, for me at least, it is all the better for it. Indeed, such is his ability as a storyteller that the inherent implausibility of the song’s narrative (the narrator chooses to die rather than admit that “he had been in the arms” of his “best friend’s wife”) doesn’t really matter. There is also a haunting quality to Frizzell’s version (aided by Don Helms’ ghostly steel guitar) which, in my opinion, the later versions have not matched. With ‘Saginaw’, which was released in late 1963, Frizzell again showed an easy mastery of the new more folk-based style. Although he had been concerned about the wordy character of the song before recording it, he sang ‘Saginaw’ brilliantly. Indeed, it is one of the great examples of his superb ability to tell a story in a song. As a song, it is something of a ‘shaggy dog’ story/parable with a typically clever country-style twist at the end. It is also one of those rare country songs where the working class narrator eventually gets to put one over on his “wealthy, wealthy” prospective father-in-law at the end. Sadly, however, ‘Saginaw’ was to be his last single to break into the country top ten. Although he continued to make some excellent records throughout the 1960s, commercial success proved increasingly elusive. One of the reasons for this was the fact that the ‘countrypolitan’ production style which became fashionable in Nashville at this time did not really suit his singing style. Nonetheless, a number of the records he made in this period come very close in quality to his previous work. Among them, two of my personal favourites are the stark There’s No Food In This House and the lovely self-penned Lonely Heart. Despite the artistic excellence of some of these records, however, Frizzell’s relative lack of commercial success in this period led Columbia Records to let him go in 1972. Ironically enough, this setback lit the spark for a remarkable, if brief, artistic revival on his part. Another key element in this revival was the new songwriting partnership he developed at this time with Sanger D. (aka ‘Whitey’) Shafer. Their collaboration was to produce some of the finest songs in Frizzell’s entire career. They were also the first in many years which could stand comparison with those he had written during his heyday in the early 1950s. The final piece in the jigsaw was provided by Don Gant, the producer who his new label, ABC Paramount, assigned to conduct Frizzell’s recording sessions with the company. His production style on the final two albums The Legendary Lefty Frizzell (released in 1973) and The Classic Style Of Lefty Frizzell (released in 1975) proved an almost perfect fit with the latter’s music. He pared back the sound and brought in musicians of the highest calibre for the sessions he did with Frizzell. These musicians included the great Pete Drake on steel guitar and Hargus ‘Pig’ Robbins on piano. Also, despite being in poor physical condition at the time (brought on by years of hard living), in these classic last recordings Frizzell produced some of the greatest vocal performances of his career. I have selected two of these as my final choices. The first is the sunnily optimistic and beautifully mellow That’s The Way Love Goes and the second, the heartbreaking portrait of a man close to the end of his tether, I Never Go Around Mirrors. In my opinion, the latter is Frizzell’s greatest song and ranks high among the greatest country songs ever written. When I saw Sturgill Simpson sing I Never Go Around Mirrors at a concert in Dublin a few years ago, he advised anyone “who didn’t like country” to leave before he started it. He offered that warning, he claimed, because “for many people, it is the quintessential country song.” Sturgill’s version that night was superb and he did that great song full justice. Here is Sturgill performing the song on KEXP-FM in 2013. Sadly, Lefty Frizzell’s sudden and unexpected death on 19th July 1975 brought this artistic renaissance to an abrupt end. Despite the fact that he died at a relatively young age, he left behind him a remarkably rich musical legacy. Indeed, many of the finest country singers both of his own generation and the one immediately afterwards (including artists of the stature of Merle Haggard and Willie Nelson) and subsequent ones (including great singers like Randy Travis, John Anderson and Dwight Yoakam) have frequently acknowledged the key influence which Frizzell had on their singing styles. While there have been greater songwriters and more profound artists than Lefty Frizzell in the history of country music, there have been very few better singers. For my money, George Jones may be the only one who regularly equalled and occasionally surpassed his prowess as a vocalist. If it is really true that a great singer can sing the phone book and make it sound good, then I could happily listen to Lefty sing it from A to Z.
You’ve surpassed yourself here Andrew. I particularly liked the technique of interspersing quotes and well chosen ones at that. “He delivered every line in a song like Henry Fonda” from Haggard, says so much. Long black veil is one of those great songs that was helped immeasurably by a great original version. Johnny Cash had it as one of the great fifty songs of all time. Lefty needs more attention. David & Dave, thanks for the kind comments. Dave – Lefty remained ‘The Guv’nor’ for Merle throughout his life. Only recently discovered that the first piece of music played at his funeral (chosen by himself) was ‘I Love You A Thousand Ways’. David – ‘Long Black Veil’ is such a great song but for me at least Lefty’s version was both the original and the best. A very good piece, Of course, I’m going to say “There’s only one Rick Danko” and go for The Band’s version of Long Black Veil. The song was always intended as a send-up, and Rick Danko steers the line beautifully between straight and tongue in cheek. As Levon Helm said “I guess we thought it was funny.” See my article on The Band website comparing the two versions. Peter, thanks for this. Had an inkling you might prefer Rick’s version. Have to say I prefer the pared back simplicity and straightforwardness of Lefty’s version. As always, Lefty’s is the ‘art that conceals art.’ Will have to agree to disagree on this one, I think. Lefty’s heyday was a bit before I became a country music fan in the early ’70s, so I came to him through covers by generational favorites Nelson, Haggard, Travis, Yoakam, et.al. You’ve given me a new appreciation for the originals. Thanks for that, Andrew, and for turning me on to Sturgill Simpson in the process. Steve, many thanks for this and keep an eye out for a Sturgill Toppermost at some point in the (relatively) near future.